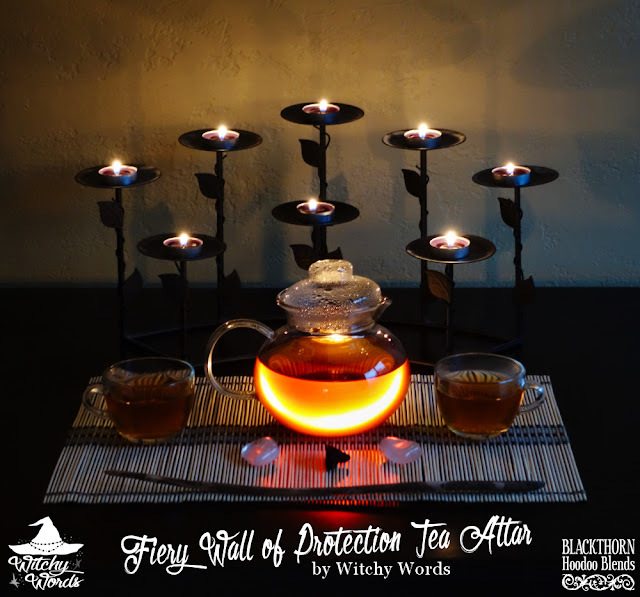 It's been a while since we've visited Amy's teas over at Blackthorn Hoodoo Blends. Between moving twice in 30 days and going for a week-long trip to Florida, things have been quite hectic in the Witchy Words household. That being said, I finally got my tea cabinet put together today and realized that I hadn't posted about this beautiful chai tea yet! I took these pictures back while we will lived at the Witchy Cottage so, to refresh my memory, I brewed another pot and began editing these photos for this post. Today, we're going to talk about Fiery Wall of Protection. Like queso cheese or Sahara desert, chai tea is a bit redundant in that chai actually means "tea." However chai, and particularly Masala chai, typically refers to a blend of tea originating from India that has a solid bite. Flavors you can expect from a good chai include cardamom, cinnamon, ginger, black pepper and cloves blended with a strong black tea base. That's exactly what you'll taste with FWP by Blackthorn Hoodoo Blends. Fiery Wall of Protection is your standard Masala chai infused with strong protective properties based on the herbs traditionally used. 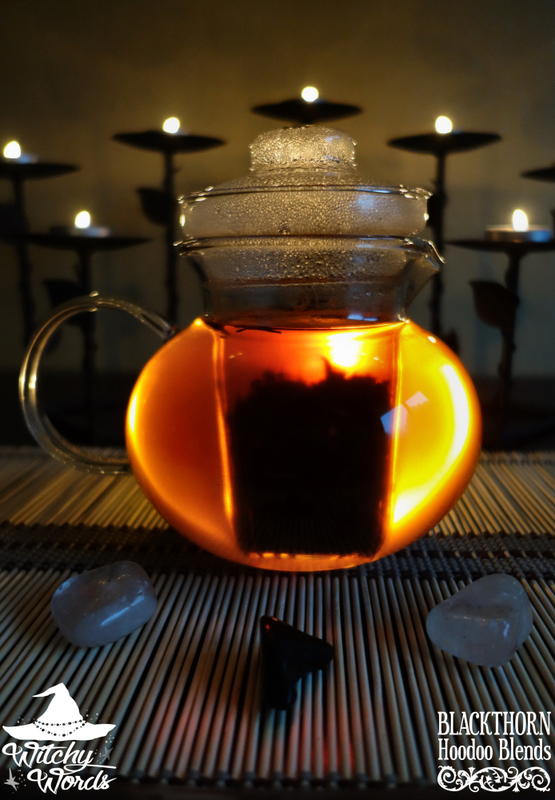 This tea would be perfect to drink before ritual to get your blood pumping or as an alternative to your morning cup o' Joe. There are a few ways you can approach brewing a chai but keep in the forefront of your mind that you want to make this kind of tea strong. Chais aren't meant to be weakly infused. The most basic method is to bring your water to a rolling boil (212F) and steep 1 teaspoon of leaves per every 8 ounce for around 5 minutes. However, traditionally, chai is made in a saucepan! Bring equal parts water and milk to a boil and stir in 1 teaspoon per every combined 8 ounces over a medium heat. 5 minutes is still usually the key time. Once you've done that, you'll want to pour the mixture through a strainer. You can even serve chai iced by doubling the amount of tea per 8 ounces and pouring the hot concoction, however you choose to make it, over ice! The end result, if you've chosen not to add your milk up front, is a beautiful golden red color akin to the reflective strips of Tiger's Eye in the light. Perhaps that's fitting, as Tiger's Eye is known as a fiery stone and was historically used as a protective charm. 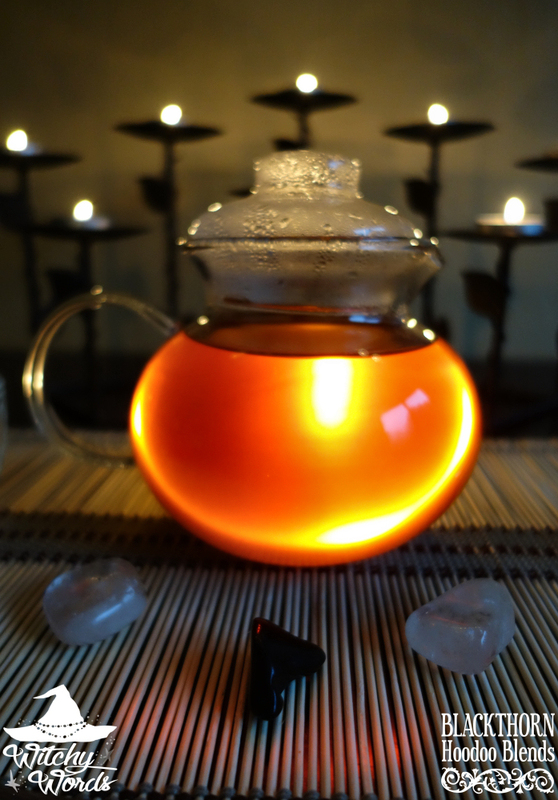 Your tea as well is going to pack a fiery punch and aid you in a little spiritual protection. This particular blend of chai from BHB offers a strong cinnamon flavor with a punch of black pepper in the back of your throat. While it's spicier than a standard smooth black tea, those with a low spice tolerance do not need to be afraid of this one. This tea is not the kind of spicy that makes you guzzle water. Instead, its strong flavors liven up your tongue in velvety deliciousness and wake you up, if you're not awake already. However, if you find the strong cinnamon blends in chai a little dry for your taste or the pepper hits the back of your throat a little hard, adding milk and sugar or honey to this tea is exactly what you should do! Masala chais are traditionally brewed with milk already in the blend, but adding milk afterward works well. You'll find that milk and sugar will sweeten the pot (pun intended), creating a smoother drink and enhancing all the variety of flavors you'll find in the blend. You'll particularly be able to taste the cloves and cardamom with just some milk. If there's any bite at all, which I found was minimal in the first place, milk and sugar are going to completely nullify it, making this a satisfying drink for all spice tolerance levels. The altar for this tea was inspired by the name of the tea itself, as the tealights (colored black for protection) create their own fiery wall behind the teapot. 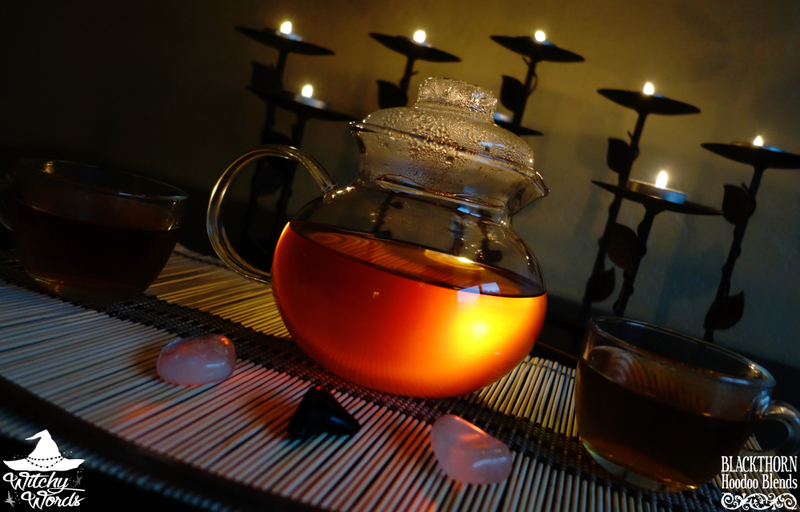 Stones with known protective traits emphasize this tea in front of the pot, and the altar is completed with a wand for directing that protection towards my front door. Of course, ingesting the tea is going to give you a jolt of spiritual protection, but I find the altars I create also have a certain power that can be employed if needed. 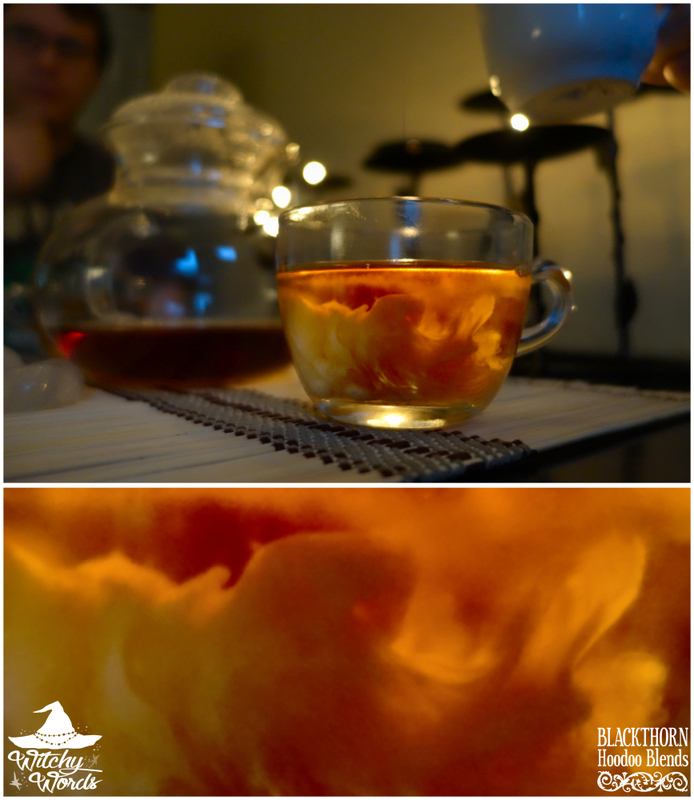 Blackthorn Hoodoo Blends teas are always a hit with my household, but chais especially so. 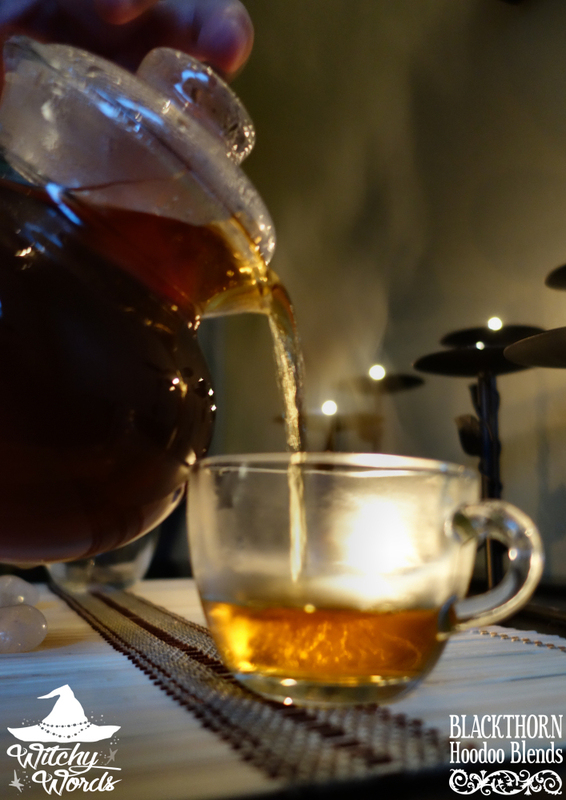 Teas tend to be fairly low-key and chais are certainly the "wild ones" of the bunch. With plenty of caffeine and flavor, don't miss out on drinking one soon!